For the first time at MAKS, Russia’s RPKB Ramenskoye avionics design bureau is showcasing its latest development, an integrated flight instrumentation and navigation system for helicopters. The solution is being presented as part of the Kazan Helicopters Ansat rotorcraft’s avionics suite. RPKB sources told Russian Aviation Insider that the system is intended for helicopters of different models. This development is expected to influence future Russian avionics offers for all types of aircraft. For example, the Ansat rotorcraft fitted with the system will be capable of IFR operations day and night, in adverse weather conditions. The system is now fully operational, and is expected to be certified by year-end. It can be customized for different cockpit sizes and missions. Possible platforms include the Kamov Ka-226 and medium-lift helicopters. The developers say the system will provide a totally new level of information visualization thanks to three large 14.1-inch 1,280×800-pixel AMLCD displays. Should one of the flight displays go inop, the system can be reconfigured in flight to feed the information onto the navigation display. Integrated TAWS functionality enhances flight safety and meets the FAP-128 requirements. The company says it is in talks with Russian Helicopters, the Russian Ministry of Industry and Trade, Rostec Corporation, and KRET Corporation (part of the Radioelectronic Technologies Concern) about the system’s marketing prospects. There already are undisclosed potential customers. Here at MAKS 2017, RPKB Ramenskoye is exhibiting as part of the KRET exposition. 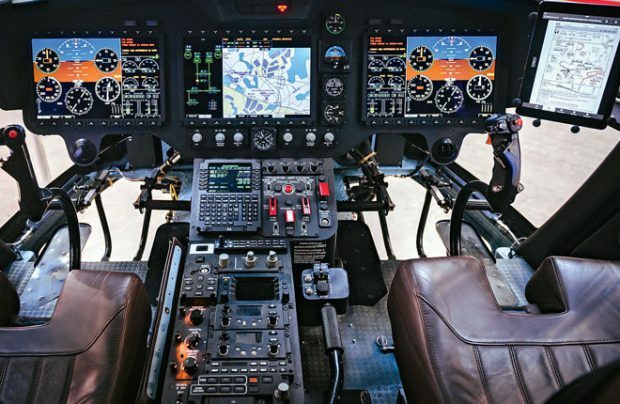 The company is expanding its scope of civil products: its avionic solutions can be found in the cockpits of Russia’s new Mil Mi-38 and Kamov Ka-62 helicopters.